Dryagonfly: After 3 years of good service the famous stone has now been muggled [v]. So now this cache has moved to the archives. 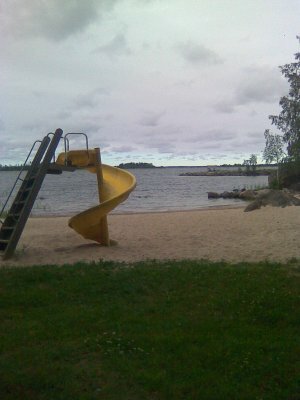 Grönvik is a popular place to swim in the summer. The cache may be difficult to retrieve at times. Take a swimsuit and towel along. Grönvik is a village and a secluded part of the larger village of Iskmo in the municipality of Korsholm, ca 15 km north of the city of Vaasa, Finland. On the 30th of July 1812 the merchant Johan Grönberg (1777-1845) obtained the government licences for the founding of a glassworks here. The factory was erected in 1813 and was the biggest of its kind in the Nordic countries during the end of the 19th century. On the shores in Grönvik there was plenty of sand and silicon, which were needed for the production of glass. The glassworks of Grönvik was discontinued in April 1907.